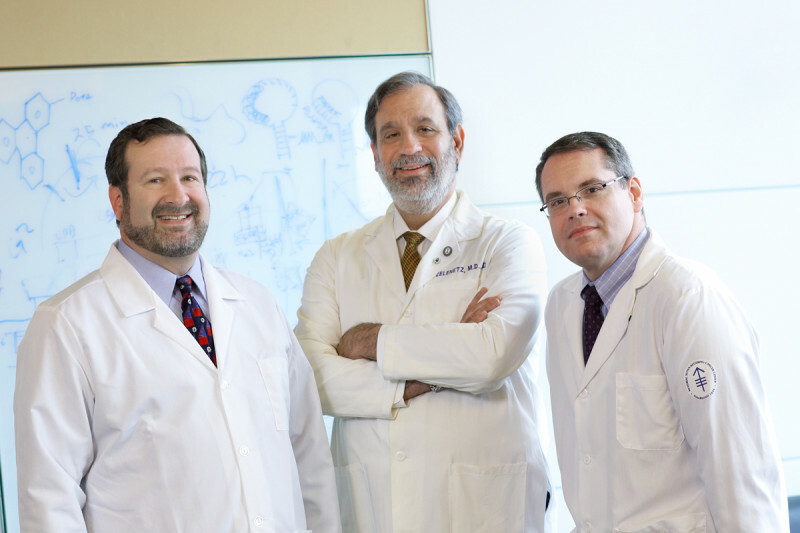 (From left) David Scheinberg, Andrew Zelenetz, and Joseph Jurcic are using monoclonal antibodies to improve the treatment of patients with leukemia and lymphoma. Therapies designed to target cancer while sparing healthy tissue show benefit, but have not yet reached full potential. The strategy of using monoclonal antibodies for cancer treatment was first described in the late 1970s with the promise that they could be developed into therapies that were highly specific to cancer cells, killing them with few or no side effects. For several types of cancer, monoclonal antibodies have already offered this advantage to patients. For other cancer types, they have provided an additional therapeutic weapon, but with smaller benefits and sometimes new side effects. “The first efforts for monoclonal antibody cancer therapy were to find antibodies that would home in on tumors and bind to proteins on the surface of cancer cells,” explained physician-scientist David A. Scheinberg. 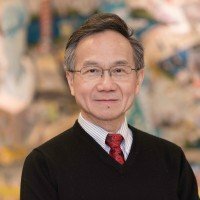 “We looked for unique proteins that were specific only to cancer cells. The idea was that the antibody would be used to stimulate an immune response in the body, which would kill the cancer cell.” Dr. Scheinberg, who is Chair of Memorial Sloan Kettering’s Experimental Therapeutics Center and the Molecular Pharmacology and Chemistry Program within the Sloan Kettering Institute, developed an antibody called M195, which targets a protein on leukemia cells, when working as a research fellow in collaboration with Memorial Sloan Kettering immunologist Lloyd Old in the 1980s. This approach further evolved when researchers realized they could use the antibody as a carrier to deliver a radioactive isotope or a toxic drug directly to the cancer cell, where it would kill the cell while sparing nearby healthy tissue. Antibodies are proteins that help the immune system to identify foreign substances by binding to them and marking them as foreign. Monoclonal antibodies are manufactured using a type of cell called a hybridoma. The hybridoma — which is engineered in the laboratory by fusing an antibody-producing immune cell called a B cell to a tumor cell — multiplies to produce a continuous supply of a specific antibody. Early monoclonal antibodies were made exclusively from mouse cells, but because the immune system can recognize these antibodies as foreign, leading to unwanted reactions, most monoclonal antibodies used today are either chimeric, consisting of both mouse and human parts, or fully human. Rituximab, which binds to the protein CD20 on the surface of B cells, has three different mechanisms of action. Its primary way of killing cancer cells is by eliciting an immune response, drawing what are known as effector cells (various types of killer white blood cells) to the tumor and activating them. This process is called antibody-dependent cell-mediated cytotoxicity (ADCC). Another mechanism is directly causing the cells to undergo apoptosis (programmed cell death). The third mechanism is by activation of what are called complement proteins. These proteins form a membrane-attack complex and poke holes in the membranes of cells, killing them. Two other drugs for lymphoma make use of antibodies as carriers for radioactive isotopes. Ibritumomab tiuxetan (Zevalin®), developed by a small pharmaceutical company, contains an antibody similar to rituximab linked to yttrium-90, a radioisotope that emits a cell-blasting beta particle. Tositumomab (Bexxar®), developed by Mark Kaminski and Richard Wahl, then at the University of Michigan, is an antibody that carries the beta-emitting isotope iodine-131. Both antibodies also target CD20. The monoclonal antibody lintuzumab targets the protein CD33, which is found on the surface of leukemia cells. The drug was developed at MSKCC and is now in several late-stage clinical trials. Another tactic for using antibodies as delivery devices is attaching them to a cytotoxic agent, such as a chemotherapy drug. Gemtuzumab (Mylotarg®), a drug that is used to treat acute myelogenous leukemia (AML), consists of an antibody connected to calicheamicin, a highly toxic antibiotic. Gemtuzumab, developed at the Fred Hutchinson Cancer Research Center, targets CD33, a protein found on the surface of leukemia cells. 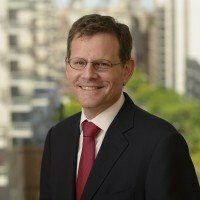 “The average age for AML patients is 68,” said Joseph G. Jurcic, Acting Chief of Memorial Sloan Kettering’s Leukemia Service. “Most of these patients cannot tolerate intensive treatments such as bone marrow transplantation, and their prognosis is usually poor. For them, a drug like gemtuzumab allows them to avoid the side effects of standard chemotherapy given systemically throughout the entire body.” Gemtuzumab allows about 15 percent of patients to achieve a complete remission when it is given to patients who have had only one relapse. Lintuzumab is another monoclonal antibody that targets CD33. It is the humanized version of M195, the antibody initially developed by Dr. Scheinberg. It is currently being evaluated in a number of late-stage clinical trials for AML as well as for myelodysplastic syndromes, a group of diseases that frequently lead to AML and other types of leukemia. Drs. Scheinberg and Jurcic are also taking their research with lintuzumab to the next level, using it to deliver a next-generation cancer treatment, dubbed a nanogenerator, to cancer cells. The nanogenerator consists of a single radioactive atom contained inside a molecular cage. The atom, actinium-225, decays by giving off high-energy alpha particles, which kill cancer cells. When actinium decays, it produces a series of daughter atoms, each of which gives off its own alpha particle, increasing the chances that the cancer cell will be destroyed. The technology was first demonstrated by Dr. Scheinberg in mice in 2001, and Dr. Jurcic is currently testing the drug in leukemia patients. Further studies starting early next year at several centers nationwide, including Memorial Sloan Kettering, will combine the drug with standard chemotherapy. Alemtuzumab (Campath®) is an antibody drug approved for another type of leukemia, called B cell chronic lymphocytic leukemia (CLL). Alemtuzumab, based on an antibody developed by British immunologist Herman Waldmann, targets the CD52 protein, which is found on the surface of these tumor cells as well as T cells. Because it destroys both B and T cells, alemtuzumab has activity in a variety of lymphoid malignancies, although it is specifically approved for treatment of CLL. Nai-Kong Cheung has developed monoclonal antibody treatments for neuroblastoma, a rare pediatric cancer. The antibody is given after induction chemotherapy (initial chemotherapy given to induce a remission), in combination with a drug called GM-CSF (granulocyte/macrophage colony-stimulating factor), which boosts the production of white blood cells. Most neuroblastoma patients also undergo surgery to remove their primary tumor and radiation therapy. The main side effect of 3F8 is intense pain at the time the antibody is given, but the pain is short-lived and does not have long-term effects. Currently 3F8 is available only to patients at Memorial Sloan Kettering, but it has recently been licensed to a company that will begin evaluating it in randomized studies at other centers around the country. Memorial Sloan Kettering investigators are looking at new approaches to make 3F8 more effective for the 40 percent of patients who don’t respond. “We believe patients who don’t respond have a different genetic makeup from those who do,” Dr. Cheung said. One current line of research is giving patients donor white blood cells (a type called natural killer cells) in combination with 3F8, “to try to bypass that genetic disadvantage in certain patients,” he explained. For patients whose neuroblastoma spreads to the brain, one of the sites of metastasis when the disease relapses, 3F8 and another antibody called 8H9 can also be armed with radioactive iodine. Because antibodies are large molecules that are unable to cross the blood-brain barrier, the treatment is injected directly into the cerebrospinal fluid. This experimental treatment has been given to only a handful of pediatric patients so far — some with brain metastases and some with primary brain tumors — but preliminary results look very promising, and about three-quarters of neuroblastoma patients who received the treatment are doing well up to five years later. One of the most well-known monoclonal antibody drugs is cetuximab (Erbitux®). First known as C225 and developed at the University of California, San Diego, by former Chair of Memorial Sloan Kettering’s Department of Medicine John Mendelsohn, before he arrived at the Center, the antibody prevents activation of a growth-signaling pathway that is found in many solid tumors, including colorectal cancer, lung cancer, and cancers of the head and neck. Cetuximab binds to epidermal growth factor receptor (EGFR), a protein that is present on the surface of both tumor cells and normal cells, especially skin cells. When cetuximab binds, it may act by preventing EGFR from activating signaling molecules that would normally tell the cell to grow and divide. In cancer cells, this can block growth and shrink the tumor. However, when the antibody binds to skin cells, it can cause severe rashes. Cetuximab is used in combination with chemotherapy to treat colorectal and head and neck cancers, and studies show that it improves overall survival by about six weeks in colorectal cancer and three months in head and neck cancers. Leonard Saltz led some of the large international trials for cetuximab, an antibody used to treat colorectal cancer. Panitumumab (Vectibix®), developed by Amgen, is another monoclonal antibody that targets EGFR and is approved for the treatment of colorectal cancer. Panitumumab is used as a single agent, and although it improves progression-free survival (the time it takes for the cancer to get worse), it has not been shown to improve overall survival. Another strategy for treating solid tumors is by inhibiting angiogenesis, the flow of blood supply to tumors that allows them to grow. The monoclonal antibody bevacizumab (Avastin®) works by blocking a protein called vascular endothelial growth factor (VEGF). When the VEGF protein is blocked, existing blood vessels on tumors are destroyed and the growth of additional blood vessels is prevented. Bevacizumab, developed by Genentech scientist Napoleone Ferrara, is also is used in combination with chemotherapy and is approved for the treatment of colorectal, lung, and breast cancers. However, for most patients with advanced disease the improvement in survival times is small. A solid tumor for which monoclonal antibodies have shown a more meaningful benefit, at least for a subset of patients, is breast cancer. About 20 percent of breast cancers have high levels of a protein called human epidermal growth factor receptor-2 (HER2). Tumor growth in HER2-positive tumors is caused by signaling from the excess of HER2 protein: HER2 binds to other proteins in the HER family and sends signals telling cancer cells to grow and to not undergo programmed cell death. Members of the Breast Cancer Medicine Service — (From left) Patrick Morris, Heather McArthur, Clifford Hudis, and Maura Dickler, treat patients with trastuzumab and bevacizumab as well as several experimental antibody-based therapies. 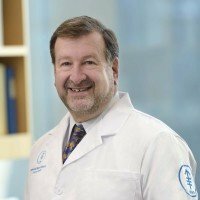 Trastuzumab, jointly developed by Genentech and Dennis Slamon of the University of California, Los Angeles, usually is given in combination with chemotherapy, and for women with late-stage disease it has been shown to improve average survival about 25 percent compared with chemotherapy alone. For women with earlier-stage disease, it can be given as an adjuvant (additional) treatment after surgery. For those patients, the drug can provide a substantial benefit, killing microscopic metastatic disease that is not clinically apparent, improving the rate of cure by 50 percent compared with chemotherapy alone. One problem with trastuzumab, as with other targeted therapies, is that many patients eventually develop resistance to the treatment. An approved drug for such patients is the small-molecule drug lapatinib (Tykerb®), which blocks HER2 signaling via a different mechanism. In addition, there are several experimental therapies in clinical trials at the Center that help get around that resistance. One is a drug called T-DM1, which consists of trastuzumab linked to a cytotoxic chemotherapy agent. Another monoclonal antibody in studies around the world is pertuzumab, which binds to the HER2 receptor in a different location than trastuzumab does. 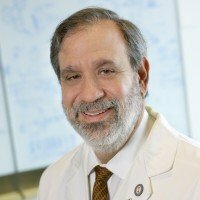 There is also a family of new small-molecule drugs, called heat shock protein 90 inhibitors, developed in part in the laboratory of Memorial Sloan Kettering investigator Neal Rosen, that can help amplify the trastuzumab effect even in patients for whom the antibody seems to have stopped working. Researchers agree that while the use of monoclonal antibodies has yet to be fully optimized and has not reached its full potential, the antibodies can still clearly benefit a large number of patients and teach investigators more about the biology of cancer. I was never advised of the potentiality of permanent damage due to the side effects and have experienced changes in vision, different types of rashes lasting for varying amounts of time, loss of hair, edema to my lower extremities, with bone and joint pain, and my ability to think and process information has changed. My heart rate will sometimes be high while my pressure is low or the opposite will occur. I will usually hear or feel like there is a bonding pulse that I can 'hear'. I experience numbness in my extremities as well as neuropathy in my feet. My fingers sometimes looking as if they don't quite belong on my hand ...usually the left hand.at which point the pain is excruciating and spasms make my fingers appear as if they are going in different directions. I tire easily. I am being followed with blood work once a month, however none of these conditions are being addressed and autogenous bone marrow transplant is being offered at this time although I am unable to function well as I tire easily. I am not sure what questions I should be asking here but I am searching for information, possibly even a second opinion. I would greatly appreciate any information that is available through Sloan Kettering. Dear Pat, we’re sorry to hear you’ve been through all this. 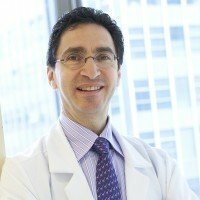 If you would like to speak with someone at MSK about coming here for a second opinion, you can call 800-525-2225 or go to https://www.mskcc.org/experience/become-patient/appointment for more information. Thank you for your comment and best wishes to you.